Hi! How are you? I'm good thanks! So I'm moving this blog site over to another blog site at wordpress. If you don't blog this means nothing. It may appear that I'm just showing my Shannon randomness, which I am, changing it all up, which I am, being difficult, which I am, for no reason, which I'm not. At wordpress I can tag my posts and it's easier for people to find me.I've gained a lot of followers over there. Plus I have pages at the top of the wordpress site which tell readers a little bit about the blog, Oli, and myself. That way when they stumble into my crazy nonsense ramblings they can be all "What is this? Who is this crazy lady and what is she talking about? Oh! Here is a menu with pages that tell me all these things! Oh! Now I get it! I shall follow this brilliant writer!" Ok. That may not be how it always goes, but I can dream right? 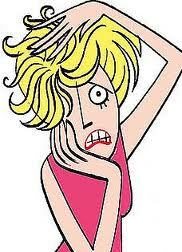 You can find me at www.mommyhasissues.com now. I've been updating both blogs, because I didn't want someone to lose me and stop reading, but it's getting exhausting. So now I'll only be writing there. I hope you find me! By the way, my brother will eventually just reroute this whole thing so when you type in www.sweetoliana.blogspot.com it will automatically take you to www.mommyhasissues.com. My bro's a computer genius and awesome! This post has been brewing for a while. I had to write a little something about this card, or cartoon, or blasphemy, whatever you want to call it. Let me just tell you, this picture PISSES ME OFF! Aaahhhh! (Imagine me yelling at my computer screen) <---This is my frustration with this gem every time I see it float past my news feed on Facebook. And I have seen several versions of this one. I can't take it anymore! I can't keep my mouth closed any longer or I will start banging my head against the computer screen, rendering myself completely incapable of complaining about random things that are annoying me. Your ONLY special need is to be loved? I’ll tell you why it makes me so mad. It completely and totally minimizes all that MY special needs child has to go through to live in this world. My blind daughter who has to navigate around in the dark in a sighted world. My non-verbal child who has to try to be understood silently in a world full of language, subtle communication, and written words. My daughter has to survive and thrive in a world that doesn’t always understand or like people who are different. People who don’t have time for, or an understanding of, or compassion, or empathy, or a sense of humor, or many more things that are needed to understand, love, and appreciate a person with autism and other SPECIAL NEEDS. It completely and totally minimizes all that WE have to go through as special needs parents. Her only special need is NOT just to be loved. It’s a whole lot more. All children need love. That one’s easy as a parent. I always love my kids. She has specific special needs. That’s why we call them special needs kids. Otherwise we would call them regular needs kids right? Or normal? No. Not normal. That’s a setting on the dryer. Vanilla? Plain? Average? Non special needs? Neuro typical? What? Kids. I have my kids. 3 of them. Or 3 children and one of them has special needs. She has many more special needs other than just to be loved. She has seizures, she takes a bunch of medicine, she doesn’t walk very well, she needs a walker at school, a walking wand, my hand. She’s not potty trained yet, she doesn’t talk, she can’t see, she has epic meltdowns, she doesn't sleep well, she has stomach issues, she has to eat special food, she needs special therapies, special equipment, special people in her life who appreciate all that she CAN do and all that she is CAPABLE of doing in the future. She has enough doctors, teachers, specialists, therapists…ect., to populate a small country. Sometimes I feel like I am running my own country. I am a dictator here in Oliland. It’s so much more than that! It’s okay to acknowledge that our kids are different. That they need different ways to help them learn and live and love and grow to be amazing people. And it REALLY pisses me off that they use the word only in front of the word special needs. Don’t even get me started on that one. 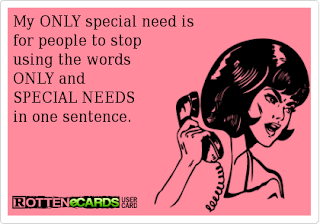 You are NEVER allowed to use the word only and special need in the same sentence.